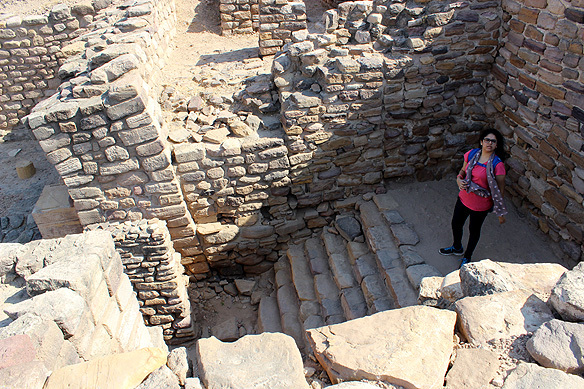 The above lines, read in the adjoining museum, accompany me as I walk into the majestic and isolated ruins of the 4,500 year old Harappan city of Dholavira. There is a hushed stillness all around. The only sounds I can hear are the birds chirping in some distance, and my guide’s quiet voice pointing to some detail or the other. The sun beats down on both me and the dusty stones strewn over the site, the latter telling me stories long forgotten and now valiantly being attempted to be reread and understood. I am in the north-east corner of Kutch, on the island of Khadir surrounded by the Great Rann. 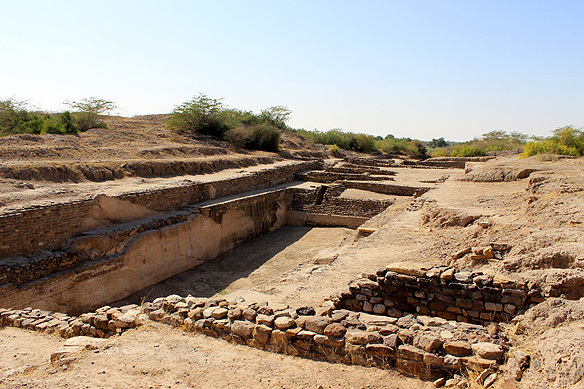 Known locally as Kotada Timba, Dholavira is one of the fifth largest of 700 Harappan (commonly known as Indus Valley) civilization sites built over an expanse of 1.25 million square kilometres stretching across India, Pakistan and Afghanistan. Discovered in 1967 by the Archaeological Survey of India, it is also the most prominent in India. Lying between two seasonal channels, the Manhar to the south and the Mansar to the north, the fortified city was an important centre of trade between Gujarat, Sindh and Punjab on one side and Western Asia on the other. 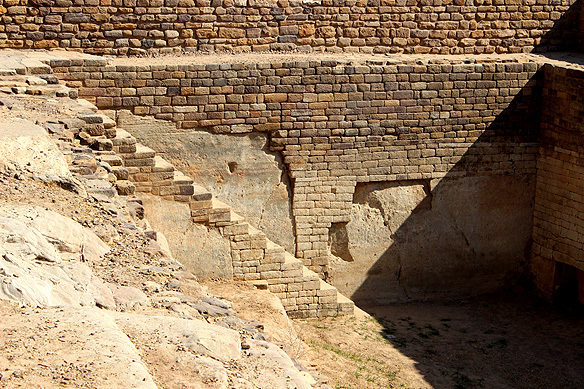 The Harappan Civilization, and along with it Dholavira, started in 2650 BC and ended around 1450 BC, abandoned only briefly in 1900–1850 BC to be reoccupied again; the period divided into seven stages of occupation. 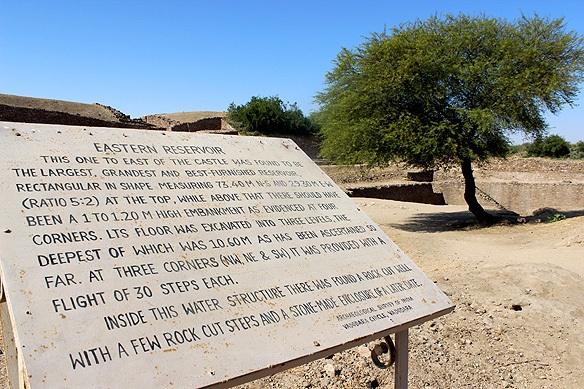 It was a Bronze Age civilization flourishing in the basins of the Indus River, and together with Ancient Egypt and Mesopotamia comprised the Old World. A population of five million is believed to have inhabited it during its heydays. 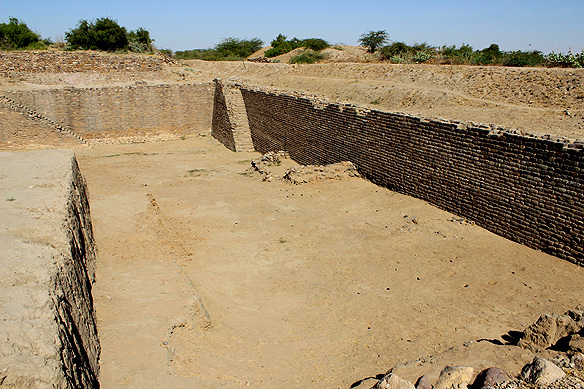 The Indus cities are predominantly renowned for their urban planning, elaborate drainage systems, water supply systems, baked brick houses, and clusters of large non-residential buildings. The Harappan script still remains undeciphered and one wonder what stories are hidden in its almost 600 distinct symbols which every now and then peep through its various findings. 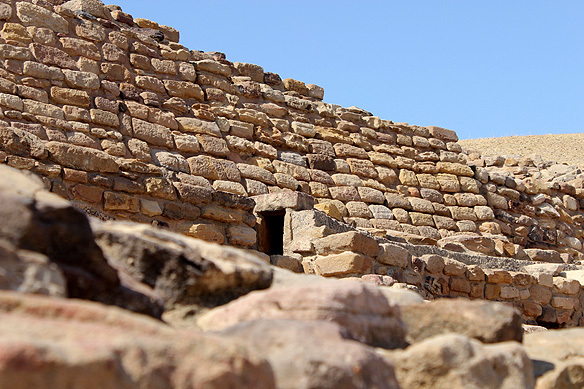 What makes Dholavira stand out from other Harappan cities is its continuous occupation over all seven stages of the civilization, its meticulous urban planning, and monumental architecture in dressed stone. But most of all, its distinctiveness is in its hydraulic engineering system inside the city walls consisting of a series of reservoirs, ponds and channels cut out from living rock. 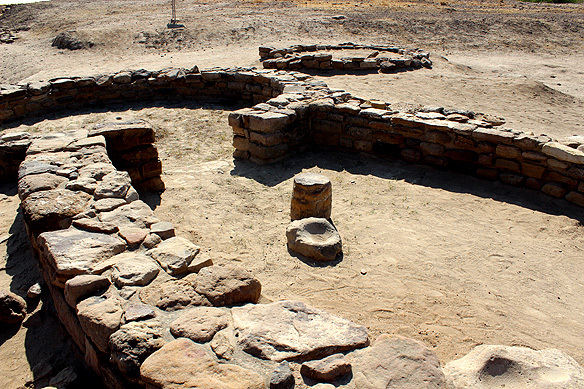 The system, one of the earliest in the Old World and completely made of stone, filtered water according to its end usage: drinking and cooking, bathing, irrigation. The reservoirs stored rain water or water diverted from the two nearby seasonal rivers, thereby ensuring there was a continuous supply of fresh water in an area which still suffers intermittent drought. 16 reservoirs were built. Three have been excavated to date. 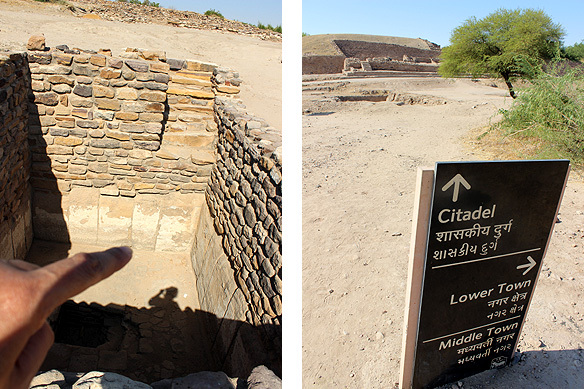 Like most Harappan cities, the city plan (771 metres long X 617 metres wide) comprises a citadel (‘castle’ and ‘a bailey’), a middle town, and a lower town, each individually fortified lying within an outer fortified wall. Though built on 49 hectares; remains have been found over an area of 100 hectares. 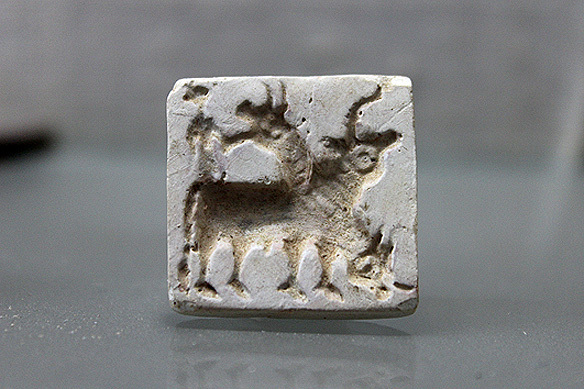 Findings include the world’s first signboard measuring about 3 metres in length containing ten letters of Indus script, square stamp seals with unicorns, terracotta figurines, vessels and beads. This entry was posted in Exploring India, Gujarat and tagged Archaeological Survey of India, Bronze Age, Dholavira, Great Rann of Kutch, Gujarat Tourism, Harappan City, Harappan Civilization, India, Indus Valley Civilization, Kutch, Old World, Rainwater Harvesting, Stamp Seals, Urban Planning, World’s First Signboard by Rama Arya. Bookmark the permalink. Thank you for reblogging komolafefatai. 🙂 Much appreciated. Crazy. Sometimes when I think about it, the mind boggles at the kind of sophisticated cities we used to build 1000s of years ago. Wow.. interesting post and inspiring as well..
Glad you liked it and found it so. 🙂 I had always wanted to visit a Harappan site. For me it was a dream come true of reconnecting with the very roots of our civilization. Mine too. I’m glad we could do this trip together. The five hour drive was absolutely worth it! Thank you for stopping by and your kind praise. Much appreciated. Mind blowing pictures that took me on the real place even I’m at home. Wanna personally go to Dholavira in the future! Thank you very much for visiting my blog and commenting. I hope you get to visit Dholavira too ! The real thing is far more impressive than my camera could capture. Hello travellers. If anyone is planning for dholavira and want accomodation & food contact us. We Rann Resort recently opened our resort at dholavira. Resort is near to white rann and just 2 km away from historic site.